Completely renovated, energy efficient and maintenance free 3 bed 2 1/2 bath NW ranch! Additional Pricing Information Available rent to own or contract purchase or traditional financing purchase. Shades of Gray Ranch! This is a MUST SEE ranch! All remodeled and turnkey ready for you to enjoy YOUR NEW HOME!! 162 Eastview Dr NW -3 bed, 2 1/2 bath ranch. Gorgeous remodel. New birch kitchen with under cabinet lighting, tiled back splash, industrial faucet and all energy efficient appliances. Master suite & man cave! Hardwood and wet bar, plus so much more! Garage, plus extra parking. Maintenance free deck and spacious fenced yard. New siding, newer roof and windows, plus so much more! Energy efficient and maintenance free! LOW utilities! 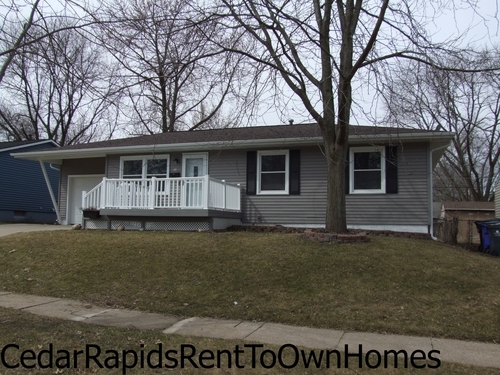 View pix and details at www.CedarRapidsRentToOwnHomes.com or call or text 319-350-4072 for more info or for a showing. This remarkable home is available "rent to own" at just $1325 per month, plus option fee, which is 100% applied to the purchase, if purchased within 12 months. RENT CREDITS APPLY. Ask how you can have an additional $1200 applied to the purchase. OR can be purchased on contract (seller financing) OR finance at your favorite lender. Call or text 319-350-4072 for more details. EZ QUALIFY. UGLY CREDIT OK.
For a personal tour, please call or text: 319-350-4072. If this lovely home is not "just what you are looking for", please call to find out about additional custom homes available in the Cedar Rapids/Marion area or visit www.CedarRapidsRentToOwnHomes.com. Caseno and I rented a home from Julie for two years. Then found out she also does Rent to Own and sells homes. That is when we decided to look at her available places and we found a beautiful home we wanted to buy. As first time homebuyers we had lots of questions. Julie made it easy to understand the process and now we are pround owners of our own home. No more renting and moving makes me happy. We loved working through the RTO process with Julie and James. She was a great landlord and the house was in great shape. James worked really hard to get us into a great loan and the process wasn't too difficult. We appreciate all their hard work for our family! Julie at Freeman Real Estate didn't just help us find a place to live, she helped us find our home affordably as well as, made the entire process like a walk in the park. When we needed the heater looked at in the middle of the winter, she helped us get someone there to look at it in no time. Julie really went above and beyond. We can't thank her enough! Julie has been very helpful throughout the entire procress from start to finish. Starting with the approval process for the rent-to-own option. She made sure we would be in a position to purchase the property within the year. The home was in fantastic shape from the moment we moved in and she acted as a great landlord during our time there. 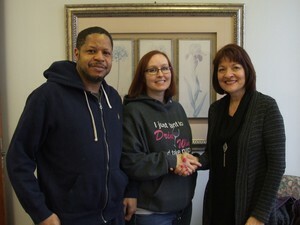 When the process of exercising our option came, she was very helpful in assisting, being it was our first time purchasing a home. We had our option fee credited, our monthly rent credits were applied and while working with the mortgage company she was very flexible and helpful in working with them and us.It has been a pleasure working with Julie and we would recommend anyone to her and her company. This experience working with Julie Freeman has been amazing. She directed me the right way, explaining exactly what I needed to do to get my credit to where it needed to be. Julie gave me advice of what lending company to work with which was Universal Lending. James was super-efficient helping me close in 3 weeks. I would recommend anyone to work with Julie Freeman and James at Universal Lending. Thank you so much for being so flexible and easy to work with. This experience has changed my life! !